Delicious Theatre is delving into the New York City underworld, where a young florist named Seymour is attempting to grow a rather mysterious-looking plant. The plant will only grow in exchange for one thing: human blood. Stumbling across it after a solar eclipse, he names the plant after his crush and co-worker, Audrey. As he discovers the true cost of keeping the plant alive, a series of moral dilemmas make him realise his own capability for true human monstrosity. We are relocating this story into the contemporary age, in which the threat of non-human intelligence is ever-increasing and our digital footprint follows us around watching our every move. We are raising £1000 to help pay for this horrifying, hilarious show. We are a Manchester theatre company founded in 2017 by three actors, a producer and a director from The University of Manchester undergraduate Drama course. We produce exciting and innovative productions of both new writing and published pieces, attempting to subvert audience expectations and play with genre. We started last year with our first production, “The Best Play Ever” by Lucio Gray and Joe Large in the basement of Solomons Cafe Bar, before taking it up to the Edinburgh Fringe in August 2017. The production received 5* reviews and we continue to develop and explore this play. 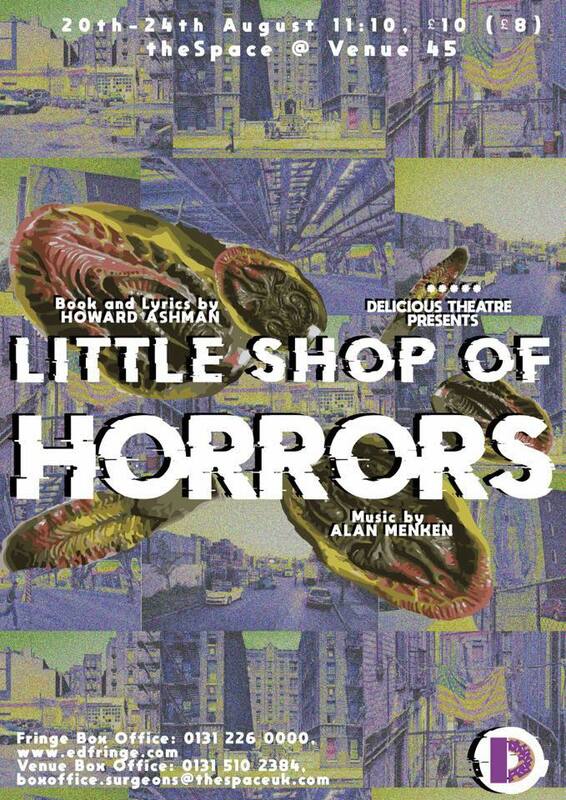 However, as well as returning to Edinburgh with “The Best Play Ever”, we’ve expanded our company this year beyond the founding members and are taking the plunge with a large-scale musical: “Little Shop of Horrors”. The majority of us are graduating in July and our intention as graduates is to establish ourselves as a professional theatre company in Manchester, continuing to make theatre beyond university. After a successful year with our first play, we intend to continue making this entertaining and innovative work with this production of “Little Shop of Horrors”. The purpose of us undertaking such a big project is to really make our voices heard in Edinburgh this year. “Little Shop” is such a famous show and we intend to do something different with it, push its boundaries and subvert people’s expectations. The jump from university theatre-making to working as theatre professionals is enormous predominantly due to funding issues. We hope that this show will really put us out there and allow us to write to major funding bodies and sponsors to kickstart us as a Manchester theatre company. Overall, we have budgeted to raise £1700 in order to pay for the performance rights, the venue fees, publicity materials, costume and set. We will give frequent updates on our social media pages about how we’re doing on fundraising. A little preview from our Seymour and Audrey! Follow us to for updates on the show! Our performances are taking place at theSpace@Venue 45, 20th-24th August, 11.10pm - see www.edfringe.com for details on tickets. You don’t need to give money to help us succeed! Please share this project with anyone you think would support us - on social media, by email, phone or even fax if you fancied it. We think this show will be brilliant, and we’d love to show it to as many people as possible. Of course, we’d love for you to donate anything you can. Please sponsor us and help make “Little Shop of Horrors” happen at the Edinburgh Fringe 2018. If you donate £10 you will receive a video shoutout from the cast during rehearsals on our Twitter page. If you donate £20 you will receive a video shoutout from the cast and a signed poster sent to your home. If you donate £50 you will receive a video shoutout from the cast, a signed poster and we will write a little song for you, thanking you. If you donate £100 or more, we will do all of the above as well as two reserved front-row seats to one of our show nights in Edinburgh.